Oxygen (Gr., acid, and yewdeiv, to generate), the most abundant of all elementary substances, having when free a gaseous form, which has never been reduced to a liquid. Its symbol is O, its atomic weight 16. It composes eight ninths of the water on the globe, nearly one fourth of the atmosphere, and a large part of the earth's crust, principally in the form of oxides of the various metallic elements. It was discovered by Priestley in England in 1774, and almost simultaneously by Scheele in Sweden. It was called by Priestley dephlogisticated air, and by Scheele empyreal air. Condorcet proposed the name vital air, in reference to its agency in supporting life. Lavoisier, whose claim to its subsequent discovery is disputed, made a series of careful experiments in which he proved that the combustion of bodies in the air consisted in their union with this gas, to which he gave the name of oxygen, because he thought it essential to the constitution of an acid; it has since been shown that this view was erroneous. - Preparation. Oxygen may be obtained by several different methods, which depend upon different physical as well as chemical principles. It may be mechanically separated from the nitrogen of the atmosphere by employing the principle of osmose in dialysis (see Dialysis), a process due to Graham. It may be obtained from water by electrolysis (see Galvanism, vol. vii., p. 596); from several of its compounds by the dissociating action of heat, as from peroxide of mercury in the original experiment of Priestley; from other higher oxides of metals by heat alone, or by the joint action of heat and some substance which will unite with a lower oxide, thus leaving a part of the oxygen free. Until recently, the usual mode of preparing it in large quantities was to subject binoxide of manganese to a red heat in a furnace, as shown in fig. 1. The cylindrical cast-iron retort a contains the binoxide, which is placed in the furnace b. One pound of good oxide will yield six or seven gallons of oxygen, with some carbonic acid, which may be removed by means of the Woulff's wash bottle c, containing a solution of potash or soda; Mn02 becomes by the action of heat MnO + O. It may be obtained from binoxide of manganese by employing strong sulphuric acid and a moderate degree of heat, a glass flask or retort being used in place of iron. The reaction in this case may be represented by the following equation: H2S04 + Mn03=MnS04 + H90 + 0. It may be procured by the dissociating action of heat on sulphate of zinc, which at a red heat gives off a mixture of sulphurous acid and oxygen, from which the sulphurous acid may be removed by washing, either with an alkaline solution or with water. Oxygen may also be obtained in decomposing sulphuric acid by passing its vapor over red-hot platinum foil or sponge, the products being, as in the last case, sulphurous acid and oxygen, H2S04-= H2O + SO2 + O. This process is recommended by Deville and Debray as the cheapest method for procuring it in large quantities. For class-room experiments and lectures oxygen is usually obtained by decomposing with heat chlorate of potash, KC103, which becomes KC1 + 30. This may be effected with the salt alone, but the high temperature required to produce perfect decomposition, and the violence with which it takes place, make it preferable to mix the salt with about its own bulk of some oxide, as binoxide of manganese. The operation may be conducted in apparatus shown in fig. 2. 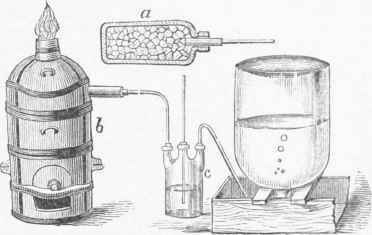 Boussingault proposed a method of obtaining oxygen by alternately oxidizing and. deoxidizing a metal or metallic base. The substance used by him was the oxide of barium or barytes, and it is raised to the peroxide by passing a current of slightly moistened air, deprived of carbonic acid, over the protoxide heated to redness in a porcelain tube. When peroxidation has taken place, the current of air is cut off, and the tube is heated to full redness, which drives off the surplus oxygen, and reduces the barytes again to a protoxide. Maréchal and Tessie du Motay prepare oxygen in large quantities by heating manganates, permanganates, or chromates of the alkalies or alkaline earths, in a current of superheated steam. The operation is conducted as follows: Binoxide of manganese is stirred to a paste with a solution of caustic soda. This paste, subjected to the action of hot air deprived of carbonic acid, is converted into manganate of soda. If now the manganate is subjected to the action of a stream of superheated steam, the salt is decomposed, the soda becoming a hydrate, and the manganic acid being reduced to a lower degree of oxidation, while a portion of its oxygen is liberated. Cylindrical iron retorts are used, through which hot air and superheated steam are alternately passed, each operation producing alternate oxidation and deoxidation of the mass, so that it may be continuous. It is said that a charge of 10 lbs. of the mass will yield 80 gallons of oxygen gas, even after it has undergone 80 operations. Apparatus of the kind is used in New York for street illumination. - Properties. Oxygen is colorless, tasteless, and inodorous, and the least refractive of all the gases. Compared with atmospheric air, it is as 0.83 to 1. No degree of cold or pressure yet applied has resulted in its liquefaction. Its specific gravity is 1. '1056, 16 times heavier than hydrogen. Its specific heat compared with that of an equal volume of air, according to De la Roche and Bérard, is 0.9765. According to Tyndall, it has less power to absorb and to radiate heat than other gases. Faraday showed that it is the most magnetic of all gases; compared with air its magnetic power is as 5 to 1; with nitrogen, about 40 to 1. In this respect its position among gases-is like that of iron among metals, and like this metal its magnetism is destroyed by heat, but on account of its gaseous condition returns on cooling, while iron remains demagnetized from its molecules having received a set. Faraday suggested that the diurnal variation of the magnetic needle may be caused by the increase and decrease of the magnetic force in the atmospheric oxygen from the variation of solar heat. Water dissolves oxygen sparingly, 100 volumes of water at 60° F. dissolving 3 volumes of the gas, and at 32° about 4 volumes. The air which is held in solution by terrestrial waters contains a much larger proportion of oxygen than atmospheric air, and this condition adapts it to the respiration of aquatic animals. - Oxygen is what is usually termed an active supporter of combustion; most bodies which are called combustibles, as hydrogen and carbohydrogen gases, coal, wood, and the various oils, burn with vividness in it when raised to a red heat. But it is strictly more correct to say that all the elements which unite in combustion are supporters of combustion. A jet of oxygen may be burned in an atmosphere of hydrogen, as well as a jet of hydrogen in an atmosphere of oxygen. Charcoal bark, heated to redness and introduced into a vessel of oxygen, is consumed with brilliant scintillations, unaccompanied with flame, in consequence of the instantaneous conversion of the carbon into carbonic acid, without the intermediate production of carbonic oxide, which in ordinary charcoal combustion is produced and causes a faint blue flame. (See Flame, and Combustiox.) Phosphorus, when ignited in a small cup attached to a bent wire, and lowered into a vessel of oxygen (cautiously, to avoid burning the hand), burns with exceeding brilliancy. If the piece is large enough not to be consumed before it boils, the vapor, becoming somewhat diffused, will give the bell glass the appearance of an incandescent body. The product of the combustion is phosphoric acid (P205), the highest oxide of phosphorus. The products of the union of oxygen with the other elements, particularly the binary compounds, are called oxides, as the oxides of the metals, like lime or oxide of calcium, potash or oxide of potassium, and litharge or oxide of lead; and the oxides of the non-metallic elements, as the oxides of nitrogen, like nitric oxide and nitric acid. (See Nitrogen.) The various oxides will be found under the heads of the elements of which they are formed. (See also Oxides.) 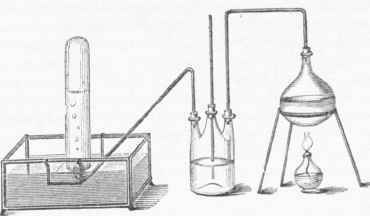 - Although, as has been remarked, oxygen is not necessary, as Lavoisier supposed, to the production of an acid, yet there is no non-metallic body which is so widely associated with the production of acid properties in compounds. In the various proportions in which a metal combines with oxygen, those compounds containing the smallest proportions are not acid, but act the part of bases, while the more highly oxidized compounds are acid. This is illustrated in the various oxides of manganese and iron. (See Maxgaxese.) In the different proportions in which it combines with nitrogen similar results are seen. (See Nitrogen.) - One of the important applications of oxygen gas is its employment as one of the elements in the oxyhydrogen blowpipe, which, with the exception of the galvanic battery, yields the highest known degree of artificial heat. The ordinary mouth blowpipe test, by which a small button of metal may be oxidized or deoxidized, according as it is placed in the outer or the inner flame, or placed upon charcoal, or mingled with an oxidizing flux, depends upon the agency of oxygen (see Blowpipe); and the process of cupellation depends upon the same principle. In these operations nitrate of potash (K2NO3) is often used with advantage for this purpose. - The wide range of affinity possessed by oxygen is evidenced by the important part it plays in the processes of chemical analysis and synthesis, and in the changes which take place during decay and fermentation, as well as in the phenomena of life in plants and animals. (See Eremacausis, and Fermextatiox.) Eremacausis is a process of slow oxidation. Oxygen is one of the most important supporters of animal life, and was therefore called by the older chemists vital air. In fermentation oxygen plays an active part in the development of yeast and the oxidation of gluten; the transformation of starch into glucose, and of glucose into alcohol; also the further change of alcohol into acetic acid. The function of anima>respiration is a process by which the absorption of atmospheric oxygen by the blood is brought about in the capillaries of the lungs, in consequence of its affinity for a constituent of the blood globules, possessing the property, according to recent experiments of Hoppe-Seyler and Stokes, of absorbing an additional quantity of oxygen in a state of loose combination, by which the blood changes from a purple to a scarlet hue, and of again yielding it up to the tissues in the performance of their function of assimilation and elimination. This constituent of the blood globules is called by Hoppe-Seyler hsemoglobine, and when in combinatibn with oxygen oxy-hsemoglobine. Prof. Stokes calls it, in its two conditions, purple cruorine and scarlet cruorine. The performance of the functions of the nervous system is dependent upon the presence of oxygen in the blood, its deficiency causing an accumulation of carbonic acid and a state of coma. Respiration also includes the elimination of carbonic acid in the animal; but in the plant, under the influence of sunlight, the absorption of carbonic acid, the fixation of carbon, and the elimination of oxygen. The action of gunpowder depends upon the weak combination of the oxygen element of nitre with nitrogen, and its strong affinity for other ingredients of the compound, as charcoal and sulphur, a union with which, at least with the charcoal, and a separation from the nitrogen, causes the evolution of an abundance of elastic gases. The drying of linseed oil and the hardening of paint is a process of oxidation, and could not take place without oxygen. The process of bronzing the surfaces of metals usually consists either in oxidizing them, or in spreading on them another metallic compound which will undergo oxidation by exposure to the air. The action of sunlight on salts of silver causes them to decompose and the silver to become converted into black oxide; and photography, in one of its modes, depends upon the fixation of oxide of silver upon paper or other material. (See Ozone).